For users of LiveLink™ for Inventor®, COMSOL Multiphysics® software version 5.3 brings improvements to the synchronized selections between programs and extends support to new versions of certain CAD file formats. Read more about the LiveLink™ for Inventor® updates below. LiveLink™ for Inventor® now automatically supports the addition of selections, defined on an Inventor® part file, to the list of selections that is synchronized with the assembly that includes the part. In other words, selections are now automatically loaded from the component files into the CAD assembly and they are correctly assigned during synchronization of the assembly. For example, consider a CAD assembly that contains seven instances of a part file that has a selection defined as a single face (see image). After synchronizing the CAD assembly, the selection in the COMSOL Multiphysics® model will contain seven faces, one for each instance of the part. To set up the selection in previous versions, the seven faces had to be selected manually on the CAD assembly in the Inventor® software. The face selection defined for the ball joint part (left) is automatically loaded for the helicopter swashplate assembly (center) in the Inventor® software. This is then directly synchronized to the COMSOL Multiphysics® model (right), such that the synchronized selection contains all instances of the original face selection. 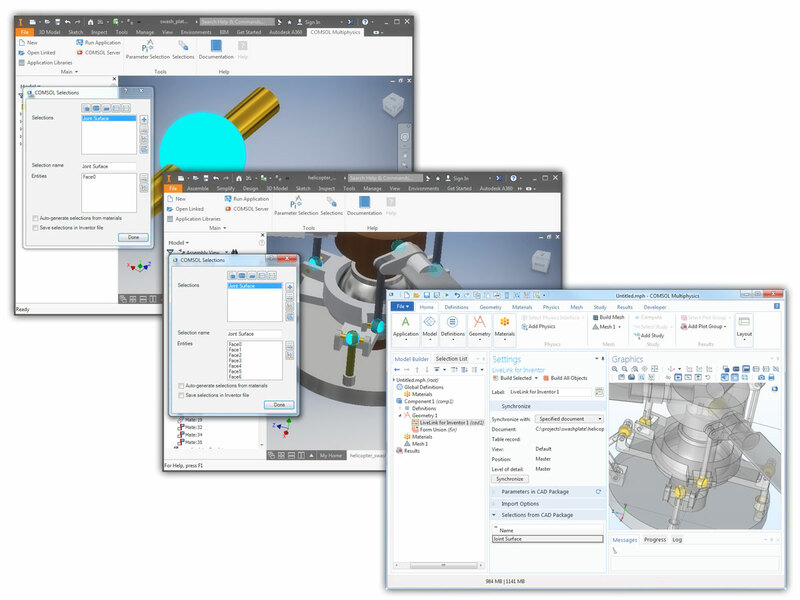 The face selection defined for the ball joint part (left) is automatically loaded for the helicopter swashplate assembly (center) in the Inventor® software. This is then directly synchronized to the COMSOL Multiphysics® model (right), such that the synchronized selection contains all instances of the original face selection.